Ronna McDaniel: The Republican Party isn't writing off Latinos. They shouldn't write the GOP off either. Ronna McDaniel The Republican Party isn't writing off Latinos. They shouldn't write the GOP off either. We recognize we face an uphill battle. But we have the message, the people, and the results to show that our party stands for them. Earlier this year, I met with a group of Hispanic Americans at a home in Florida to discuss the issues that matter to them and the values that unite us. We spoke about the future we want for our children and the policies that help us achieve our American Dream; we discussed family values and family businesses, school choice and tax cuts. Gathered around a coffee table in a living room in Miami, we discussed what it means to be a Republican. It's not just me: The entire Republican National Committee is engaging with the critically important Hispanic community to get out the vote in November, as part of a long-term effort to demonstrate our shared values. Previously, campaigns and parties would drop into communities a few months ahead of Election Day. But five years ago, the RNC resolved to make a long-term commitment to people across America. Where once we sent a political activist to knock on your door, today you'll find a friend and neighbor who shares the values of the community. Some of the people who took part in that living room conversation had recently arrived from Puerto Rico, where Hurricane Maria devastated their communities. They were just beginning to rebuild their lives in Florida, and our team welcomed them with open arms, ensuring they received support along the way. We started “bienvenido a Florida” meetings to connect these families with local school district officials, faith and business leaders and party representatives. Our work in Florida is just one example of the RNC’s engagement with Hispanic Americans everywhere. We recognize that we face an uphill battle with a community that does not always identify as Republican. But we have the message, the people, and the results to show that our party stands for them — and that President Trump’s agenda, with the help of Republicans in Congress, empowers them to achieve their American dream. Latinos need a voice, but where is it? The RNC works every day to get our message heard. Since President Trump was elected, we have held dozens of events with Hispanic Americans. We have hosted bilingual Republican Leadership Initiative workshops to train Hispanic activists to organize in their neighborhoods. We partner with community leaders to host roundtables and house meetings to discuss issues about which Hispanics care, from school choice and jobs to tax cuts and religious freedom. We have conducted voter registration drives and attended local parades and festivals. We hire from within their communities for grassroots and other field positions at the RNC, including field directors, regional field directors, deputy state directors, state directors and more. Our objective is to meet people where they live, work, study and pray. Each of these face-to-face interactions is about building rapport, cultivating relationships and encouraging people to vote for our candidates this November. From our Wisconsin luncheon with Hispanic pastors, to a business roundtable in Georgia with Hispanic leaders and a school choice forum in Texas , the RNC actively continues these conversations about our shared values. Many attendees at our events later join us to spread our message as volunteers. Hispanic Americans care about policies that create a better business environment, lessen burdens for them to thrive in the job market and empower them to do what is best for their families. They are leaders and entrepreneurs who raise families and start businesses. Today, we have a president who has made our concerns — their concerns —the cornerstone of his agenda. President Trump is committed to helping the millions of Americans who work hard for a brighter future for their families and our country. His policies have created an economy that works for everyone, slashing unemployment to historic lows, including last month’s near-record low of 4.7 percent for Hispanics. Our labor market is strong, middle-class Americans are taking home bigger paychecks and small business optimism (as measured the National Federation of Independent Businesses) is at a record high. This is great news for the over 4 million — and rapidly growing — Hispanic-owned businesses across the country. The vast majority of these are small businesses, and overall they contribute more than $700 billion to the U.S. economy each year, according to Geoscape. Hispanic entrepreneurs are confident in today’s economy and ready to expand their businesses. President Trump understands Hispanic Americans’ interests range from more jobs to safer neighborhoods and the freedom to do what is best for their families. That is why he fights to empower students and parents through school choice. He makes communities safer by strengthening law enforcement and eradicating street gangs. He stands for religious liberty at home and abroad. He provided billions in funding for hurricane recovery in our country’s affected areas, including providing more funding for Puerto Rico than his predecessors. And he sanctioned oppressive regimes in Venezuela, Nicaragua and Cuba, offering humanitarian aid to the people suffering. Every issue we discussed in that Miami living room last spring propels the president’s agenda. To maintain that progress in the years ahead, it is more important than ever to get out the vote on November 6. We share the same passion for the American dream and honor the same ideals: Faith, family, and respect for every individual. I have learned that we have far too much in common to let anyone divide us. This year, let us stand together and make sure we let the Republican Party and President Trump continue to fight for what unites us. 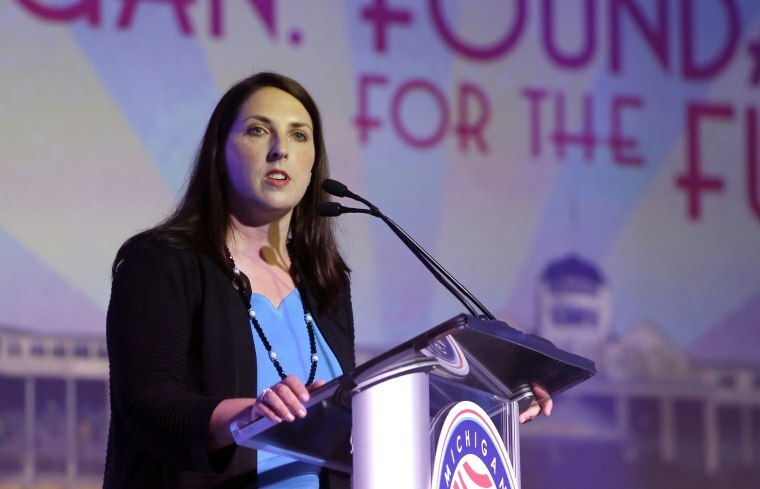 Ronna McDaniel is the Chairwoman of the Republican National Committee (RNC).